In fact, such a system was first reported as long ago as 1981. This contains a cobalt carbonyl anion of the type [Co6H(CO)15]–. The hexacoordinated hydrogen had a measured 1H NMR chemical shift of 23.2 ppm (very low field), a value normally more associated with a proton rather than a hydride. What does quantum mechanics say about this system? The QTAIM (ωB97XD/6=311G(d,p) calculation) is shown below. 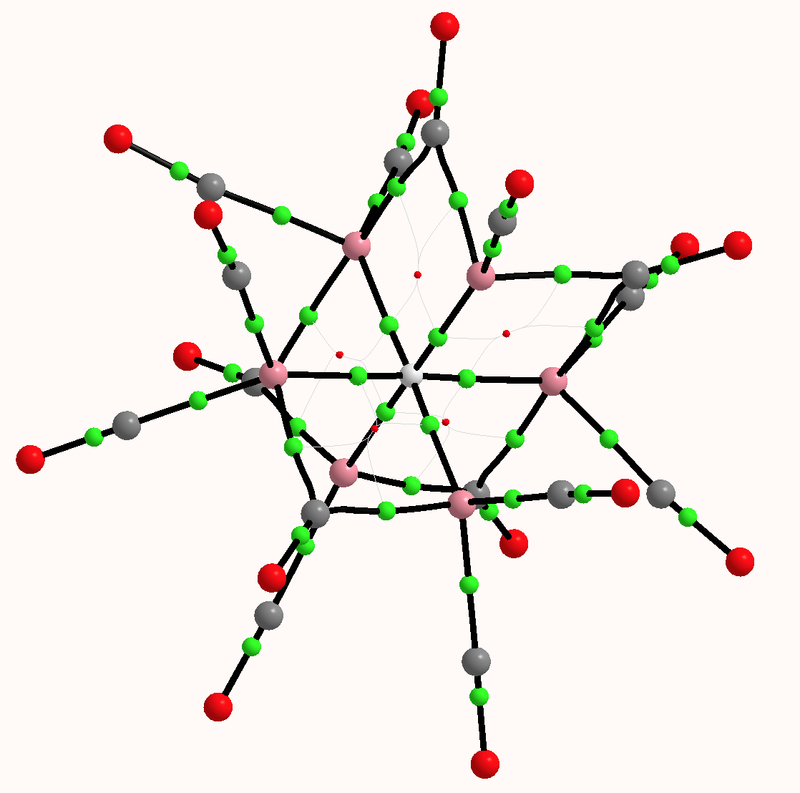 The green spheres represent bond critical points, and indeed six surround the central hydrogen with octahedral coordination. The value of ρ(r) for these varies from 0.074 to 0.082 au, which is a higher electron density than might be found for e.g. a hydrogen bond (which is typically 0.020 – 0.010 au). The individual Co…H Wiberg bond order indices are ~0.1 (the total Wiberg bond index is 0.86). The computed 1H chemical shift (relative to TMS) of the hydrogen is 30.8 ppm, which seems to agree with an interpretation based on a proton in the interstitial cavity. However, the NBO natural charge on this hydrogen is -0.41, for a valence population of 1.40 electrons (and a Rydberg population of 0.01), which makes it more of a hydride anion than a cationic proton. NBO characterises this electron population as “Lp” (Lone pair). One might conclude from these apparently opposed indications that the deshielding of the 1H is less to do with its resemblance to a proton, and is more due to the local magnetic currents originating from the metal atoms. 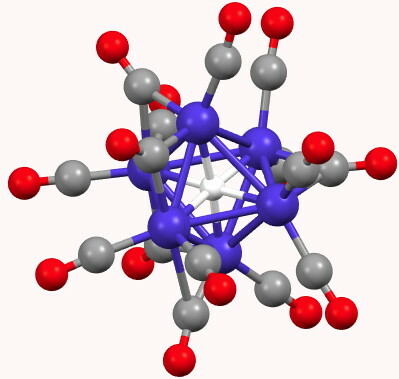 It is still nicely surprising that even an element as small as hydrogen can sustain hexa-coordination. It also reminds that although each of the coordinations is via what can reasonably be called a bond, the hydrogen nevertheless does not exceed its maximum valence electron shell electron count of two; in that sense it is not hypervalent. This entry was posted on Monday, July 8th, 2013 at 1:42 pm and is filed under Hypervalency, Interesting chemistry. You can follow any responses to this entry through the RSS 2.0 feed. You can leave a response, or trackback from your own site. Regarding hexacoordinate hydrogen, I computed Oh H7(-) in 1995. It had nine imaginary frequencies. What is the QTAIM atomic charge of the central hydrogen? Is it like NBO and predicts extra population of electrons in hydrogen basin?